This is a 6 month program starting Feb. 1st. Kit includes all the hand-dyed and mill-dyed wool to construct the quilt top; includes pattern and binding. 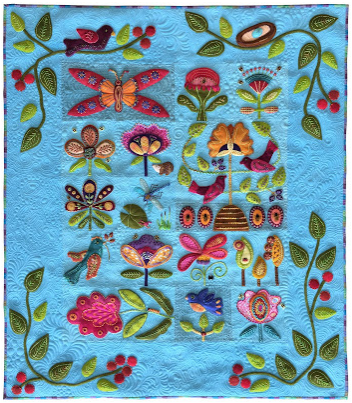 This beautiful, brightly colored art quilt is 100% hand-dyed wool and is embellished with both silken pearl and artistic threads from Painter’s Threads. 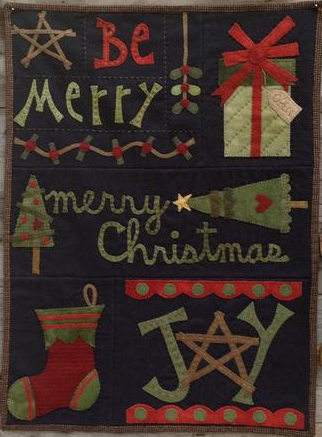 Each block is appliqued onto a wool background and the applique motifs are primarily wool with a bit of cotton just to make it interesting. Embroidery embellishes the applique and there are lots of bees along with a spider, caterpillar, lady bugs, frog, dragon fly, birds and flowers. 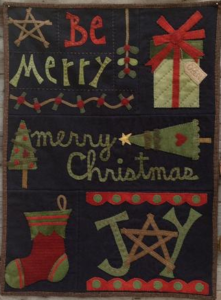 Kerry Green has posted detailed instructions on her blog to help with the embroidery stitches. Finished size is approx. 36” x 42”. The Solstice Dream pattern book is a 42 pages of full color photos and complete instructions on high quality paper that is spiral bound. This is a 10 month program beginning Feb. 15th. 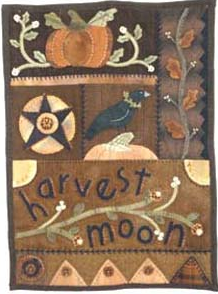 This project combines homespun background fabrics with hand-dyed and mill dyed woolen applique shapes. This is a 13 month program beginning Feb. 1st. 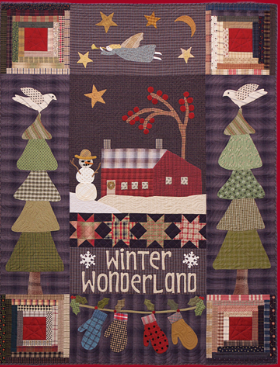 Includes patterns, background fabric, wool applique shapes, borders and binding. 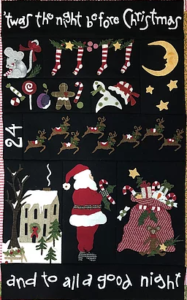 We have changed Norma’s original pattern to include more wool applique, but the wonderful cotton trees and the homespun house remain the same. Lettering, mittens, elements in the Angel block, the birds on the trees and the snowman, star and tree in the house block have been converted to wool. This is a 7 month BOM program starting Feb. 15th., pattern and binding included. Be Merry by Wooden Spool Designs. This is a 5 month BOM starting February 15th. 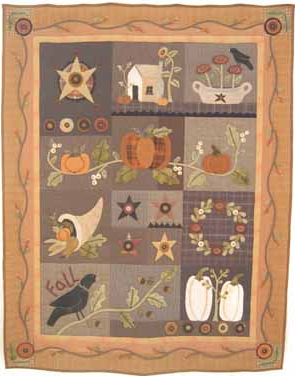 The background will be flannel and the wool applique shapes will be hand-dyed wool. 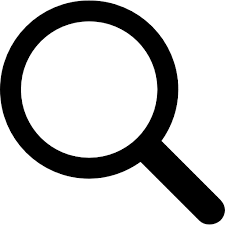 Pattern, backing and binding included. Twas the Night before Christmas by 1894 Cottonwood House. 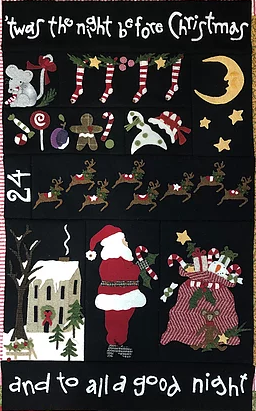 Each month, beginning 1/1/2019, you will receive the pattern, wool for the appliqué shapes and a flannel background. The final month will include the binding, backing not included. 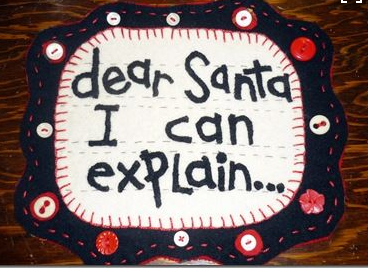 Stop by the shoppe to see our embellished version, courtesy of Monica Jansen. Monica will be putting together a guide to stitches and threads used. This guide will be in the monthly kits. A thread kit that includes 5 Silken Pearl, 2 Eleganza and 2 Wisper threads will be available for $50 for those participating in the BOM.